It's Monday, right? 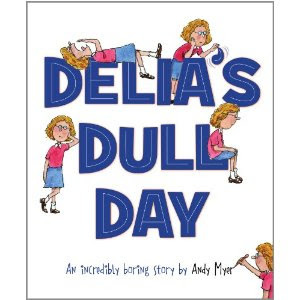 A perfect day to check out Delia's Dull Day is "an incredibly boring story" by Andy Myer. I have to tell you that my kids haven't discovered the word "bored" yet. I used it once and my son asked me what it meant. I'm not going to fool myself into thinking that that he will not, at some point, use this word to describe his own state of being but it sure would be nice, right? I distinctly remember being young(er) and saying I was bored and my mother telling me how she and I could fix that problem. I learned never to say I was bored. I also remember thinking (sometimes I still do) that life is dull. I like adventures and sometimes I (as we all do) go through seasons of life where nothing particularly "exciting" happens. (Then exciting things do happen and you wish for times that are more "boring.") Delia is having a very dull-ish sort of existence. Nothing exciting ever happens to her. She makes breakfast, goes to school and pretty much just exists. Or so she thinks. This book is very cute in that it keeps the tone of a child who is feeling dull and boring in the text. However, the illustrations paint quite a different story. While Delia is complaining that nothing happened at breakfast except for spilling some milk, we see an elephant tromping through the room. She complains that nothing happened when she walked to school. But if she had looked up, she would have seen a wonderful array of hot air balloons. Most of the time, Delia is missing life all around her because she's busy looking down or is focused on herself. This is an awesome book for teaching us to look up and outward to see the beauty that is life all around us. It reminds me you to take a few moments to look at the sky, focus on the faces of others and think outside of one's own self. I really enjoyed it and my children found humor in it as well. It's a great book for making you laugh at yourself - which is sometimes exactly what we need to do. Do you think that you and yours might enjoy this book? Well, I have happy news! I have one copy of Delia's Dull Day AND a signed print to give away to one of you! Would you like to win? Simply leave a comment below. (Please remember to leave a valid e-mail address in your comment.) This contest is open to U.S. Residents only and is open through Monday, October 29th. THIS CONTEST IS NOW CLOSED. THE WINNER, as selected by Random.org is #8 - Rainbow. Congratulations! Thank you, Sleeping Bear Press, for shooting a copy of this book my direction in exchange for my honest opinion. Thanks also for the extra copy and signed print which you have offered to one of my readers! Sounds like something we would enjoy! Sounds like a fun read! I'm guilty of this sometimes... I forget to find excitement in the little things! Nice! What a good lesson for kids to learn. My mom would always tell us we could clean our rooms if we were bored. hehehe! I hope it's not too late to enter.